Guidestone in the USA -  An epic journey of new discovery so fantastic that our natural instinct would be to block it out. 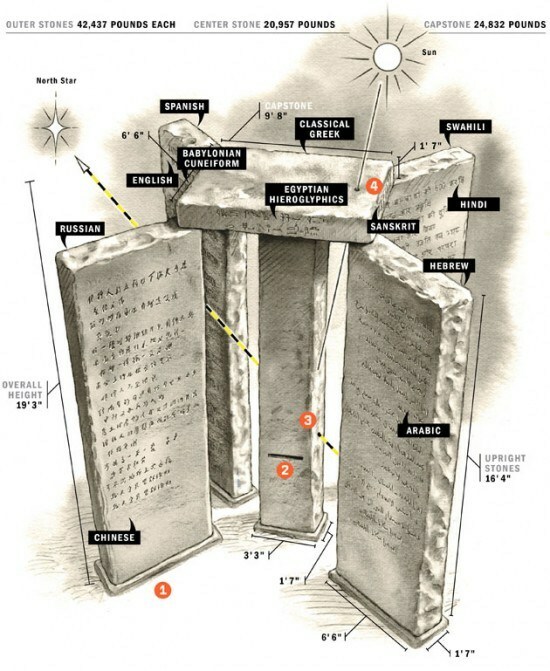 Why was the Year "2014" Recently Added to The Georgia Guidestones? Mystery Cube Removed and Destroyed! The Georgia Guidestones. In June 1979, a stranger going by the name of R.C. Christian showed up at a granite company in Elberton, (GA) wanting to construct an edifice to transmit a message to mankind, offering guidance to humanity. Erected in March 1980, this granite monument known as The Georgia Guidestones. It sits on a hill approx. 10 miles north of Elberton. Its four giant stones and are engraved on both sides with the following 10 Guides, or commandments, in eight different languages (English, Spanish, Swahili, Hindi, Hebrew, Arabic, Chinese and Russian). It is a nearly 6m tall monument made of six astronomically aligned granite slabs; there is a capstone, one slab stands in the center, and around it stand four vertical slabs. The north/south pair of vertical granite is aligned to the poles. The central hollow of the structure is designed to be lit by light from the sun at noontime no matter the time of year. Jacques-Yves Cousteau (1910-97). French oceanographer. The Georgia Guidestones are located on a hilltop in Elbert County, Georgia, approximately 90 miles (145 kilometers) east of Atlanta, 45 miles (72 km) from Athens (precise distance is 44.3322 miles), GA and 9 miles (15 kilometers) north of the center of Elberton. On one of the highest hilltops in Elberton County, Georgia stands a huge granite monument, which I will henceforth refer to as “the thing”. Engraved in eight different languages on the four giant stones that support the common capstone are “10 Guides”. That monument is alternately referred to as the “Georgia Guidestones”, the “American Stonehenge”, or more appropriately – “the thing”, which is what I call this gargantuan pile of rocks. Though relatively unknown to most people, it is an important link to the Occult Hierarchy, which dominates the world in which we live today.The origin of this strange monument is shrouded in mystery, because no one knows the true identity of the man or men who commissioned its construction. All that is known is that in June, 1979, a well-dressed and very articulate stranger visited the offices of the “Elberton Granite Finishing Company” and explained that he wanted to build an edifice to “transmit a message to mankind”. He identified himself as “R. C. Christian,” but it became apparent that this surname was not his real name. other than Scientology founder L. Ron Hubbard. He said that he represented a group of men who wanted to offer direction to humanity, but to date (23 years later) no one knows who “R. C. Christian” really is, or the names of the group of men he represented. Several things are apparent. A message consisting of a set of ten guidelines or principles is engraved on the Georgia Guidestones in eight different languages, one language on each face of the four large upright stones. Moving clockwise around the structure from due north, these languages are: English, Spanish, Swahili, Hindi, Hebrew, Arabic, ancient Chinese, and Russian. 1. Dramatically reducing the population of the world. 3. Establishing a world government. 4. Promoting a new spirituality. The stones are placed so that a slit at eye level in the central upright slab permits an observer to view the eastern horizon and aligns with the position of the rising sun at the Summer and Winter Solstices. Through the center stone, from south to north, a two-inch diameter hole is inclined at an angle of 34 degrees and points to the North celestial pole. A beam of sunlight passing through a hole in the capstone forms a spot of light below. The position of the spot can be used to determine high noon and the day of the year. An eye-level, oblique hole is drilled from the South to the North side of the center, Gnomon stone, so that the North Star is always visible, symbolizing constancy and orientation with the forces of nature. A slot is cut in the middle of the gnomon stone to form a window which aligns with the positions of the rising sun at the Summer and Winter Solstices and at the Equinox, so that the noon sun shines to indicate noon on a curved line. The cap stone includes a calendar of sorts, where sunlight beams through a 7/8 inch hole at noon, and shines on the South face of the center stone. As the sun makes its travel cycle, the spot beamed through the hole can tell the day of the year at noon each day. Allowances are made because of variations between standard time and sun time to set the beam of sunlight at an equation of time. The site was chosen because it commands a view to the East and to the West and is within the range of the Summer and Winter sunrises and sunsets. The stones are oriented in those directions. The hole that you see in the stone was drilled in the Center Stone so that the North Star could be visualized through it at any moment. This was one of several requirements stipulated by R.C.Christian for the building of the American Stonehenge and reflects his obsession with the alignment of the stars, the sun, and the moon. Occultists often worship the alignment and movement of heavenly bodies as part of their religious ceremonies. * Maintain humanity under 500,000,000 in perpetual balance with nature – Means the entire human race at its climax level for permanent balance with nature. * Guide reproduction wisely – improving fitness and diversity. Without going into details as yet undiscovered, this means humanity should apply reason and knowledge to guiding its own reproduction. “Fitness” could be translated as “health.” “Diversity” could be translated as “variety”. A “living” language grows and changes with advancing knowledge. A “new” language will be developed “de novo” – and need not necessarily be adopted from any languages now in existence. * Rule Passion – Faith – Tradition – and all things with tempered reason. “Faith” here may be used in a religious sense. Too often people are ruled by blind faith even when it may be contrary to reason. Reason must be tempered with compassion here – but must prevail. Courts must consider justice as well as law. Individual nations must be free to develop their own destinies at home as their own people wish – but cannot abuse their neighbors. * Avoid petty laws and useless officials. * Balance personal rights with social duties. Individuals have a natural concern for their personal welfare, but man is a social animal and must also be concerned for the group. Failure of society means failure for its individual citizens. * Prize truth – beauty – love – seeking harmony with the infinite. The infinite here means the supreme being – whose will is manifest in the working of the cosmos – if we will seek for it. * Be not a cancer on the earth – Leave room for nature – Leave room for nature. In our time, the growth of humanity is destroying the natural conditions of the earth which have fostered all existing life. We must restore reasoned balance. The eye-level, oblique hole is drilled from the South to the North side of the center, Gnomen stone, so that the North Star is always visible, symbolizing constancy and orientation with the forces of nature. A slot is cut in the middle of the Gnomen stone to form a window which aligns with the positions of the rising sun at the Summer and Winter Solstices and at the Equinox, so that the noon sun shines to indicate noon on a curved line. The cap stone includes a calendar of sorts, where sunlight beams through a 7/8 inch hole at noon, and shines on the South face of the center stone. As the sun makes its travel cycle, the spot beamed through the hole can tell the day of the year at noon each day. Allowances are made because of variations between standard time and sun time to set the beam of sunlight at an equation of time. The site was chosen because it commands a view to the East and to the West and is within the range of the Summer and Winter sunrises and sunsets. The stones are oriented in those directions. A few feet to the west of the monument, an additional granite tablet has been set level with the ground. This tablet identifies the monument and the languages used on it, lists various facts about the size, weight, and astronomical features of the stones, the date it was erected, and the sponsors of the project. It also speaks of a time capsule buried under the tablet, but the positions on the stone reserved for filling in the dates on which the capsule was buried and is to be opened are missing, so it is not clear whether the time capsule was ever put in place. The tablet is with one edge to each of the cardinal directions, and is inscribed such that the northern edge is the “top” of the inscription.The complete text of the explanatory tablet is detailed below. ​The original spelling, punctuation and line breaks in the text have been preserved in the transcription that follows. The text of the tablet is as follows: At the center of each tablet edge is a letter representing the appropriate compass direction (N, S, E, W), contained within a small circle. "A soon-to-be published research paper, 'Human and Nature Dynamics (HANDY): Modeling Inequality and Use of Resources in the Collapse or Sustainability of Societies' by University of Maryland researchers Safa Motesharrei and Eugenia Kalnay, and University of Minnesota's Jorge Rivas, was not solicited, directed or reviewed by NASA. It is an independent study by the university researchers utilizing research tools developed for a separate NASA activity. As is the case with all independent research, the views and conclusions in the paper are those of the authors alone. NASA does not endorse the paper or its conclusions." Civilization was pretty great while it lasted, wasn't it? Too bad it's not going to for much longer. According to a new study sponsored by NASA's Goddard Space Flight Center, we only have a few decades left before everything we know and hold dear collapses. The report, written by applied mathematician Safa Motesharrei of the National Socio-Environmental Synthesis Center along with a team of natural and social scientists, explains that modern civilization is doomed. And there's not just one particular group to blame, but the entire fundamental structure and nature of our society. Analyzing five risk factors for societal collapse (population, climate, water, agriculture and energy), the report says that the sudden downfall of complicated societal structures can follow when these factors converge to form two important criteria. Motesharrei's report says that all societal collapses over the past 5,000 years have involved both "the stretching of resources due to the strain placed on the ecological carrying capacity" and "the economic stratification of society into Elites [rich] and Masses (or "Commoners") [poor]." This "Elite" population restricts the flow of resources accessible to the "Masses", accumulating a surplus for themselves that is high enough to strain natural resources. Eventually this situation will inevitably result in the destruction of society. Elite power, the report suggests, will buffer "detrimental effects of the environmental collapse until much later than the Commoners," allowing the privileged to "continue 'business as usual' despite the impending catastrophe." These are great suggestions that will, unfortunately, almost certainly never be put into action, considering just how far down the wrong path our civilization has gone. As of last year, humans are using more resources than the Earth can replenish and the planet's distribution of resources among its terrestrial inhabitants is massively unequal. This is what happened to Rome and the Mayans, according to the report. ... historical collapses were allowed to occur by elites who appear to be oblivious to the catastrophic trajectory (most clearly apparent in the Roman and Mayan cases). Economic growth is the biggest destroyer of the ecology. Those people who think you can have a growing economy and a healthy environment are wrong. If we don't reduce our numbers, nature will do it for us ... Everything is worse and we’re still doing the same things. Because ecosystems are so resilient, they don’t exact immediate punishment on the stupid. In maybe the nicest way to say the end is nigh possible, Motesharrei's report concludes that "closely reflecting the reality of the world today ... we find that collapse is difficult to avoid." "Although the study is largely theoretical, a number of other more empirically-focused studies — by KPMG and the UK Government Office of Science for instance — have warned that the convergence of food, water and energy crises could create a 'perfect storm' within about fifteen years. But these 'business as usual' forecasts could be very conservative." Well, at least zombies aren't real. Update: NASA has issued a clarification about its role in the study, saying that while the study relies on NASA research tools developed for another project, it did not directly solicit, direct, or review Motesharrei's paper. "As is the case with all independent research, the views and conclusions in the paper are those of the authors alone. NASA does not endorse the paper or its conclusions." John Robison (1739-1805) was a Scottish scientist, who late in life wrote the one of the definitive studies of the Bavarian Illuminati. He was a contemporary and collaborator with James Watt, with whom he worked on an early steam car, contributor to the 1797 Encylopedia Britannica, professor of philosophy at the University of Edinburgh, and inventor of the siren. Although Robison was very much an advocate of science and rationalism, in later life, disillusioned by the French Revolution, he became an ardent monarchist. In this work, Proofs of a Conspiracy, Robison laid the groundwork for modern conspiracy theorists by implicating the Bavarian Illuminati as responsible for the excesses of the French Revolution. The Bavarian Illuminati, a rationalist secret society, was founded by Adam Weishaupt in 1776 in what is today Germany. They had an inner core of true believers, who secretly held radical atheist, anti-monarchist and possibly proto-feminist views, at that time considered beyond the pale. They recruited by infiltrating the numerous (and otherwise benign) Freemasonic groups which were active at the time on the continent. ​Necessarily they had a clandestine, compartmentalized, hierarchical organizational form, which has led some modern conspiracy theorists to identify them as the original Marxist-Leninist group. However, this is most likely simply a case of parallel evolution. Since we don't have convenient access to the source documents of the Bavarian Illuminati we have to rely on Robison and the AbbÃ© Barruel's Memoirs Illustrating the History of Jacobinism, both in the 'opposing views' category, for information on this group. The Illuminati have today become a byword for a secret society which hoodwinks its junior members and puppet-masters society at large. This reputation is in no little part due to Robison's book.